There is more to being a professional fishing guide than what meets the eye and it takes more than a knack for fishing to qualify for any of the guide teams at The Club. All guides must have various forms of certification that require many hours of classroom time and examinations. Then there is the mechanical side, both the intricacies of the fishing gear and the boat, including its engine, operating systems, safety and navigation equipment. They also have to be expert boat operators, particularly when a fish is on and deft maneuvering is required to optimize the angler’s chances. But perhaps most importantly of all, The Club’s guides must have a genuine love of the ocean and be even-keeled and affable on every shift, irrespective of conditions or duration of season. It’s not for everybody. But fortunately for guests, The Club’s sterling reputation on all fronts makes it a first pick among the finest guides in the business, including North Island Lodge head guide D.J. Shinduke. Now entering his 27th consecutive season at NIL, we asked D.J. to talk to us about the guiding life in a place renowned for the finest Pacific salmon fishing in the world. This is what he told us. D.J. and guests enjoying a nice day and the comforts of our new 24′ ft Northwest boat. I grew up in the Okanagan Valley near Vernon, and my introduction to fishing was fly-fishing all the small mountain lakes and trolling for Kokanee and big rainbow trout on the larger lakes. When did you decide to be a guide? I started at North Island Lodge in 1993 and never left. I was 19 years old and originally thought I was going up to work on the dock, but one of their guides had quit and so they were short one guide. They used to shut the lodge down for a week and give everybody a break and that’s when they brought me in. Their head guide, Steve Shelley, stayed up there for that week and we fished every day. So he just more or less gave me one-on-one training for a week straight. It was a great start and a great year. D.J. with a 54 lb chinook caught by angler Mike Fisher at Boulder Bay back in 2003! What certifications do professional guides require? You need four tickets: you need Marine Emergency Duty; Small Vessel Operating Proficiency; Marine First Aid and your Radio Operator’s Certificate. All together it requires a lot of classroom time and written and practical exams. These are really important because the emphasis has to be on safety at all times. What skills do you look for when you are hiring guides? Ideally, guys who grew up fishing, like with their uncles or their dads. Also, a people person who can deal with all kinds of people from young guys in their twenties right up to elderly people. And they have to really love the outdoors and be able to stay out in a boat all day and in all types of weather. Most of our guides tend to be from BC, especially Vancouver Island. We’ve had some guides that didn’t grow up salmon fishing but they were great with people and they caught on pretty quickly. We have a guy like that at North Island now, Morgan Johnston. He was our dockhand but he took a real interest in it and went out fishing whenever he could and became a really good guide. We’ve also had some guys from Ontario who grew up fishing for walleye, pike, musky and lake trout. As long as they have the other qualities, the people skills especially, they can do quite well. North Island Lodge – your home away from home. What is the best part about guiding? Being out on the water and the wildlife – the dolphins and whales and birds. And the smell of the ocean and the salt air, the sounds of the surf smashing on the rocks, and the fishing of course. Another good part is the camaraderie especially around the cleaning table. Somebody will come in with a 12-pounder and you’ll heckle him a bit, and then he’ll turn the water hose on you. It’s all in fun. The entire crew at North Island is like a family. Another big one is getting to know so many of the groups and guests over the years. For me that’s been really enjoyable. What is the most difficult part about guiding? The long days and no days off. When it’s August and you’ve been fishing for 70 or 80 days straight you have to tell yourself that it’s the guests’ trip and it’s the only one they’ll do all year so you have to be at your best at all times. That’s why the people skills are so important, and keeping a positive attitude. D.J. with coffee in hand, ready for another adventurous day on the water. We are up at 5:30 and we meet at the truck at 6:00. We head down the hill to The Clubhouse dock. We keep a couple of North Island boats there and we take those over to North Island Lodge. We wipe the boats down, warm up the motor, turn on the sounder and GPS. We can grab a breakfast sandwich from the lodge, maybe a banana and a thermos of coffee or tea and then we head out at 6:30. We fish for four or five hours and are back at 11:30. We clean the fish and the boats and then we go back up to the penthouse for lunch. We get about an hour break. Most people take a nap. We meet again at two and head back to the dock and depart our dock at 2:30. We fish until 7:30 and then come back and do the same thing, clean the fish and the boat and then take a couple of boats back to The Clubhouse dock and up the hill. What is the role of the head guide? I coach and help the younger people. If it’s a group of guests, there is often somebody who wants to talk to the guide in charge to explain how they want their trip to go. We get three or four trips a year that book the whole lodge and they’ll come and explain things to me. You crack the whip a bit and make sure the young guys are keeping their boat clean and keep an eye on them on the water and provide a bit of coaching if need be. But that doesn’t happen very often. Generally speaking our guys are all very good at what they do and conscientious. D.J. and the late Al Norris with a memorable 51 lb chinook. How much information do guides share among each other? There is a fine line between doing what you need to do to help out your own guys and tipping off the competition from the other lodges. When there are lots of fish around it’s not a big deal, everybody’s happy, but when it’s tough you’re damned if you do and you’re damned if you don’t. If you get onto some fish and you don’t say anything on the radio, we call that “creaming out.” The other guys will say “hey, you creamed us out.” And then if you do let them know and a whole bunch of boats suddenly converge on the same place, they might say “you called the bite!” So, we try to keep it low-key and say something like “we’re hitting a few” but it’s tough. What’s the biggest fish you’ve guided? A 60. I can’t remember the guest’s name but it was off Andrews Point many years ago. 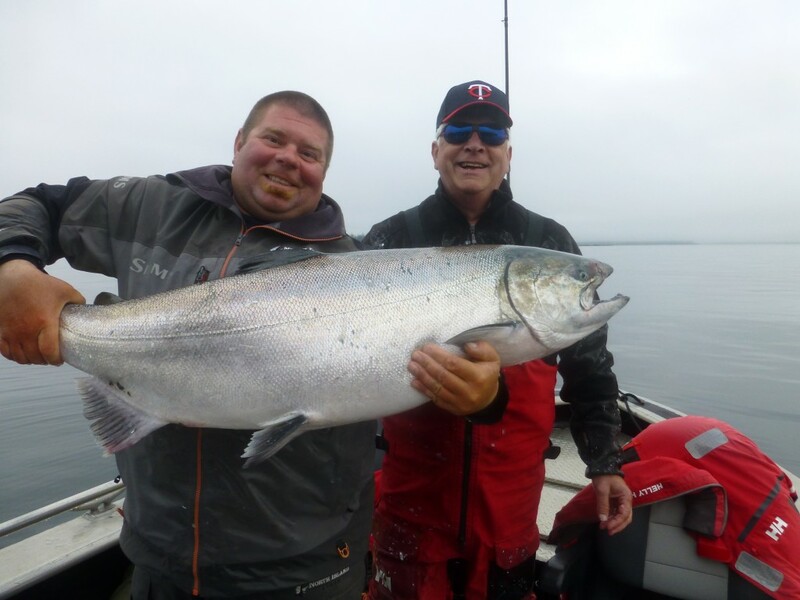 But in my second year one of my guests, Keith Oberg, got a 58 at Seath Point. My most recent big fish was with a long-time guest that everyone liked named Al Norris and it was about 50 or 51 pounds. Al and his wife Amy came up every year but sadly, he passed away just a couple of years ago. I also guided a 20-pound coho, but the strangest one was a 26-pound chum! Any chance you’ll tell us where the biggest fish are around Langara Island? Secure your date now and join us in Haida Gwaii for an unrivaled experience on and off the water with friends, family or colleagues! Contact us at 1-888-432-6666 or click here to make an online inquiry.